It's official - my love for meat has reached excruciating highs. I never really thought about this relationship between meat and I, and while I can ashamedly admit that I could never be a vegetarian, it was only today when mum cooked breakfast for the family and made a portion of stir-fried beef just for me that jolted me into a deep reflection about my meat-eating ways. True that - mother knows best. And it is the main reason why I chose a Brazilian Barbecue restaurant to celebrate my birthday. I've been here before, but a neverending flow of meat never fails to excite me. Lapa's yes and no signals; I am both proud but slightly horrified to declare that mine never quite made it to the red side. 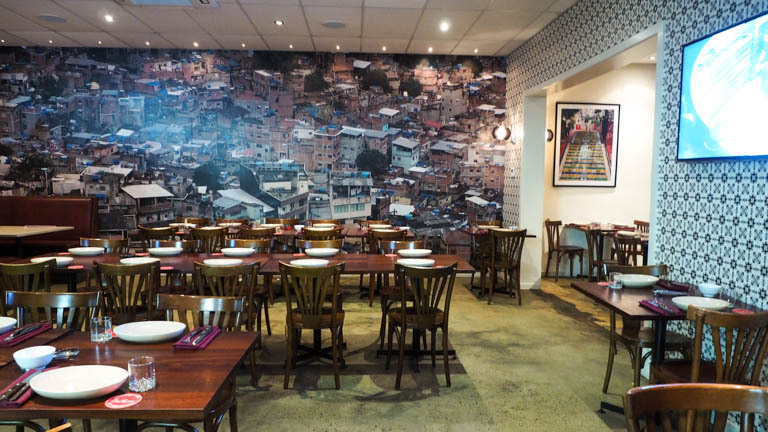 The policy at Lapa is that groups of 6 or more must order the Rodizio, a Brazilian style endless feast offering all the meat you could possibly consume. At the set price of $50 per person, diners can eat their way through 16 different cuts of meat freshly carved off skewers straight onto your plate by waiters who do continuously rounds through the restaurant, weaving between tables with skewers and trolleys of meat freshly grilled from the kitchen. 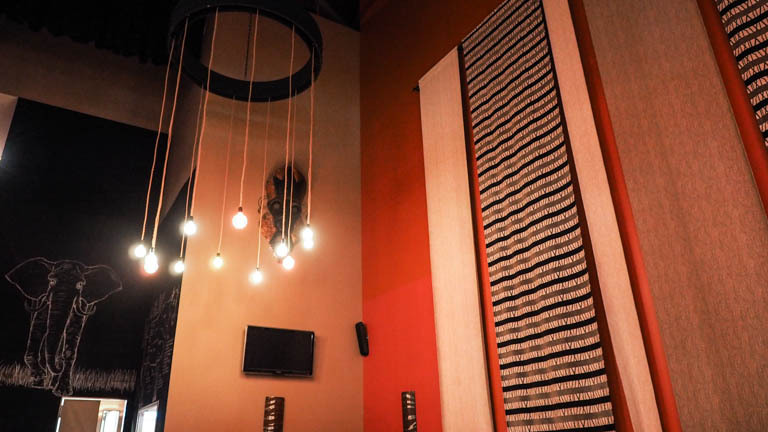 Eating at Lapa can be a boisterous and merry experience or it could be a silent affair - especially when you are simply too full for words. Individual place cards for each person can be flipped to red to signal waiters to stop with the meat offering, indicating that 'I am too full to even open my mouth to tell you to stop' or kept on green to silently shout "Please throw all the meat you have at me, go, go, go!" The great thing about the endless feast option is that there is no waiting involved. As soon as you are seated the side dishes arrive almost immediately and send you well on your way to forgetting about all the meat to follow, so don't waste valuable stomach space! 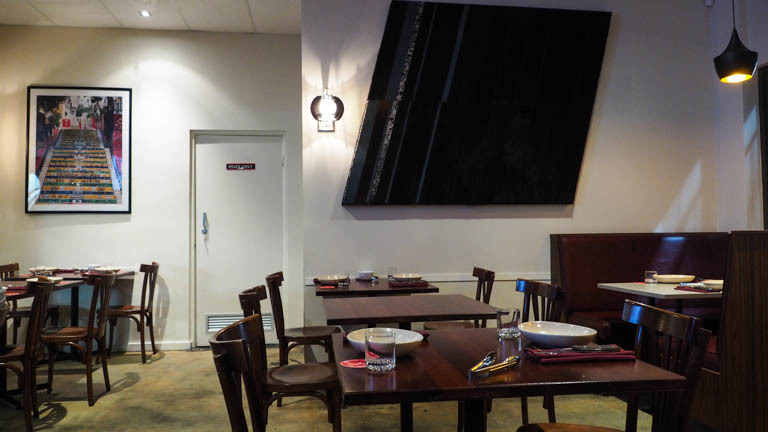 The table is quickly lined with different sized bowls of side dishes that come with the endless feast, and staying true to its name, the refills you are able to get are of course, endless. Side dishes are plentiful, and include garden salad, a creamy potato salad, crispy hot shoestring fries, plain white rice and a deliciously flavoursome black bean stew. 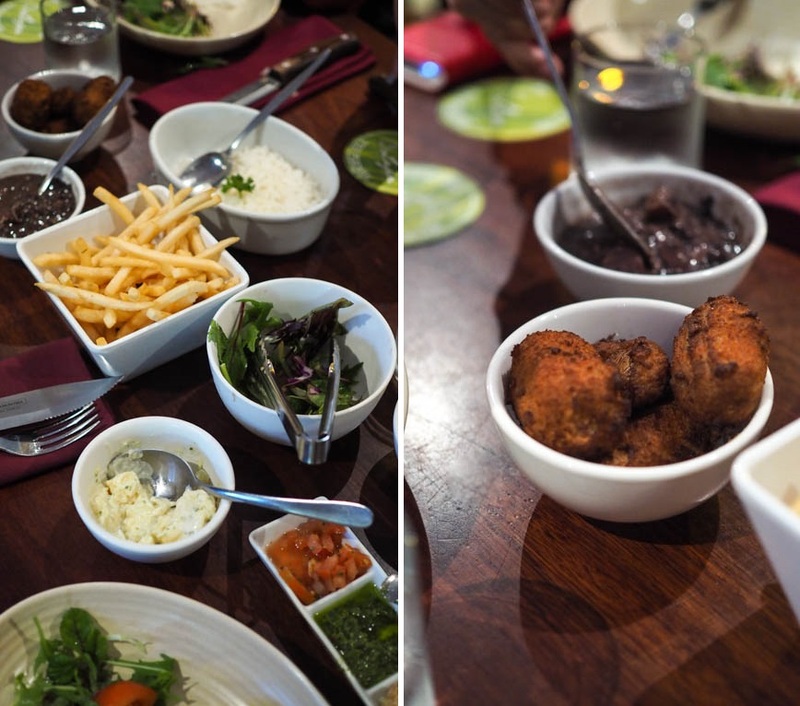 Something I'd prefer to be done differently is for their bananinha frita (such fun to say!) to be delivered towards the end of dinner so that these desserty-type sweet crumbed bananas can be savoured after rather than at the beginning of a meal. Brazilian salsa with a punchy vinaigrette and chimichurri sauce (green sauce made up predominantly of parsley, garlic and olive oil). Also pictured is farofa: roasted cassava flour and bread crumbs with bacon. Many hands start reaching for the bowl of cheese balls; a perfectly plump and doughy pillow of cheesy bread with a slight chewy texture. They are quite a hit as my niece evidently takes a liking to them and devoured two in quick succession. 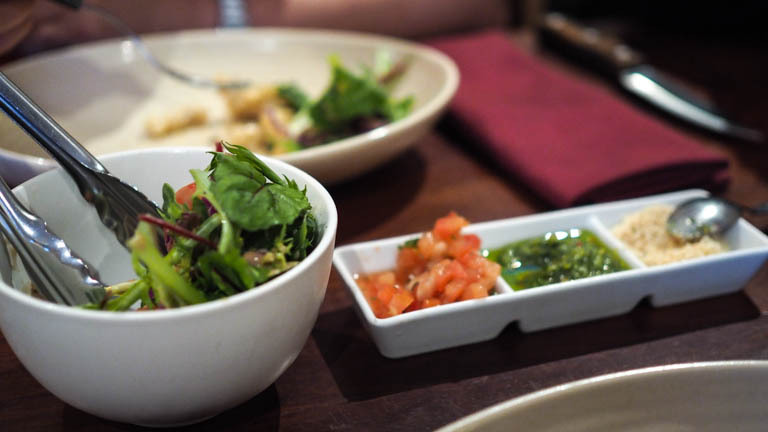 Sides that aren't placed at the table is a selection of two pastas from Lapa's daily pasta specials, served fresh steaming hot from the kitchen. The three vegetarian pastas include a white sauce lasagne, spaghetti napolitana and spaghetti al garlic, a lovely rich dish with strong garlic aroma. Oh, the spaghetti. Mum could not stop asking for that spaghetti. Lapa also serves a winning grilled pineapple, a real godsend in carnivorous situations with its acidity to cut through the heaviness of eating truckloads of meat. The pineapple is grilled to a beautiful golden brown, glistening from the caramelisation of cinnamon sugar liberally sprinkled all over the fruit. The grilled pineapple itself is sweet and so extremely moreish, that I get a hot, freshly grilled serving after greedily asking the kitchen to grill just one more batch just before they turn off the grills for the night. Phew! 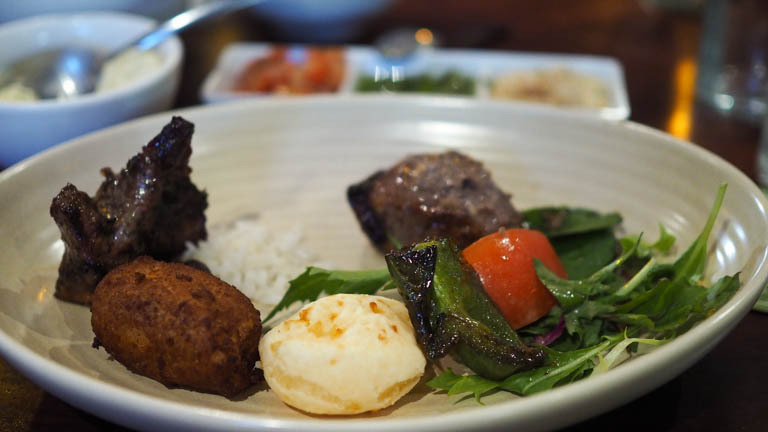 Up until this point it has been a meatless affair and if you aren't careful, you might fill up on starters before the real deal of this Churrascaria has even started. 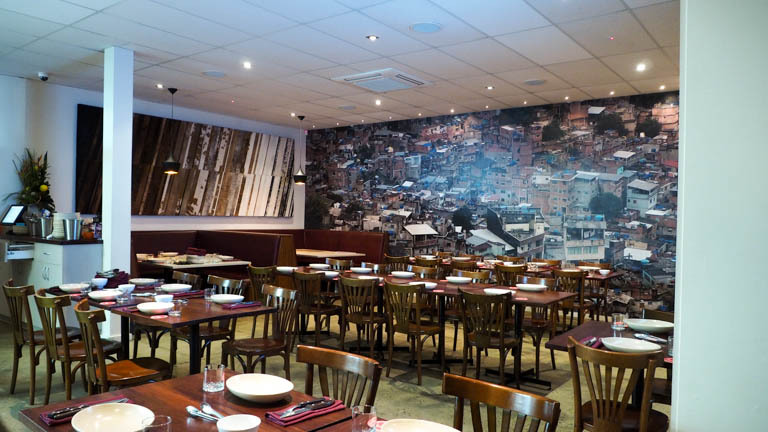 As a typical Brazilian restaurant, a churrascaria's cooking style is predominantly barbecued meats, lovingly grilled to ensure meat is succulent, juicy and sealed with flavour. 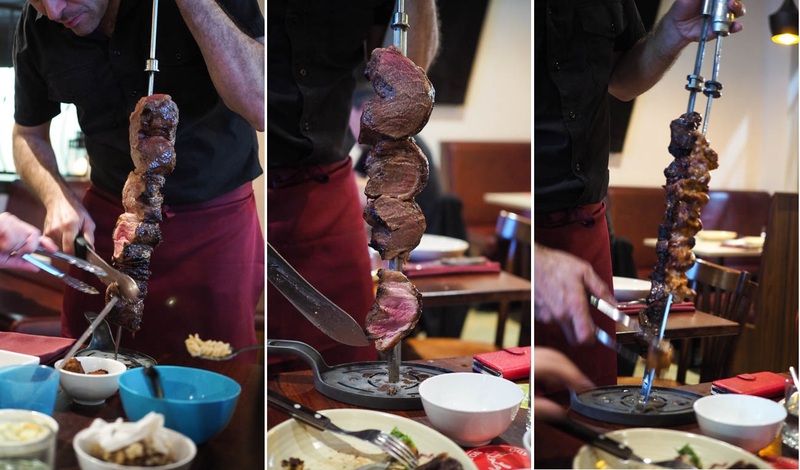 Your serving is carved in front of your eyes; quite literally, at eye level, by smiling waiters who ask for your assistance to help transfer the meat off the skewer onto your own plate. A look akin to extreme eagerness surely must cast over the face of every single diner here, in anticipation of their first piece of meat! Over the course of the meatful night, we work our way through the large selection of different meat cuts, some of which were better than others. The different meats come in rounds, and you should resist the temptation to indulge in one or two types at the beginning when you know you have another fifteen waiting for you later on. Chicken: chicken wings, chicken with cheese, garlic chicken, chilli chicken and small, dainty chicken hearts. The standouts that night that have left an impression on me was definitely the rump cap, grilled to a pale pink in the middle and just so tender. Another favourite on the table were the beef ribs, cooked to a beautiful softness with nicely rendered fat and threads of meat easily pulled apart as well as the fiery red tainted chilli chicken pieces. There were one or two meats which were overdone and gristly as a result, but one bad egg never spoils the entire basket. 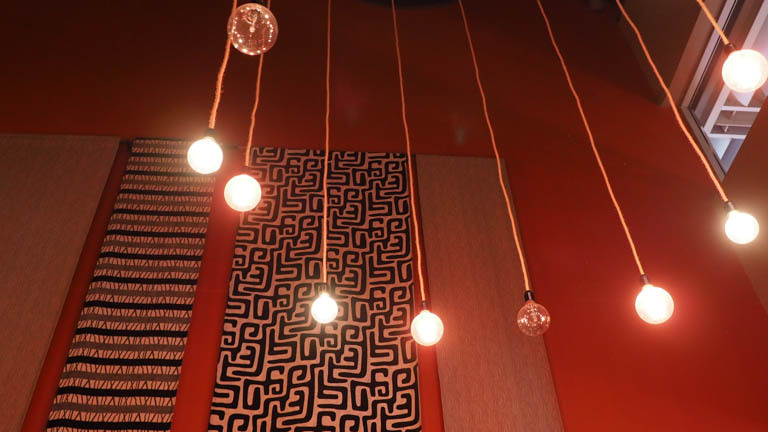 There's a real joyous atmosphere in the Lapa restaurant; there's festivities all around and you are pretty much guaranteed that there will be someone there celebrating their birthday on the night you dine. 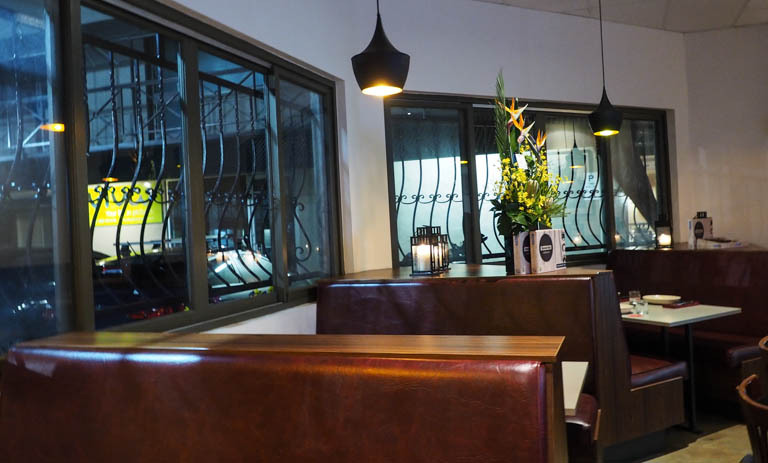 It is a casual and very comfortable setting, making it great for families; they set up coloured plastic cutlery and bowls for little ones and even the manager himself came by our table with some confectionery specially for the 4 year old eating with us. 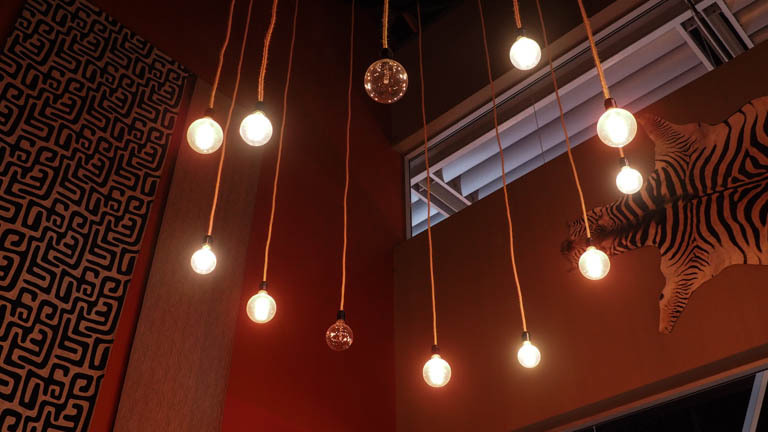 When you dine out at a restaurant, it's often the little things that staff do for you that you notice and appreciate most. My aunt does not eat beef, and when she declined one waiter who was doing laps around our table with one beef dish after another one too many times, he asked what she wanted to eat and offered to ask the kitchen to make it for her. This was a simple, genuine gesture that impressed us with how considerate the staff were and really set an example of great hospitality. 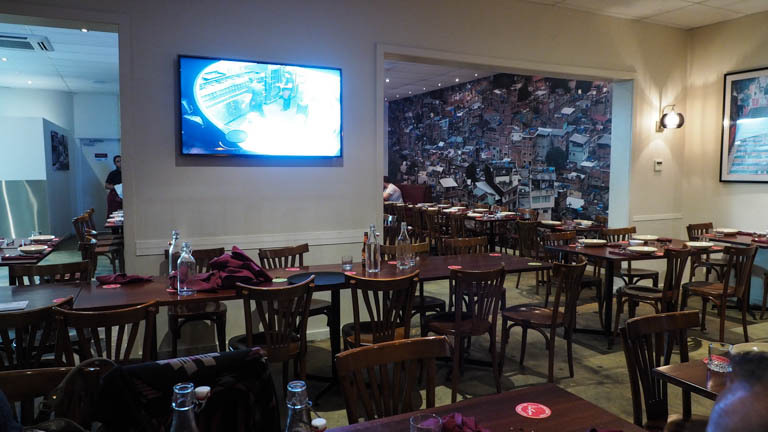 You are never far from the live action in the kitchen regardless of where you sit in the restaurant, thanks to a wall mounted television monitoring the moves of the chefs in the kitchen preparing and marinating meats and grilling their hearts away. 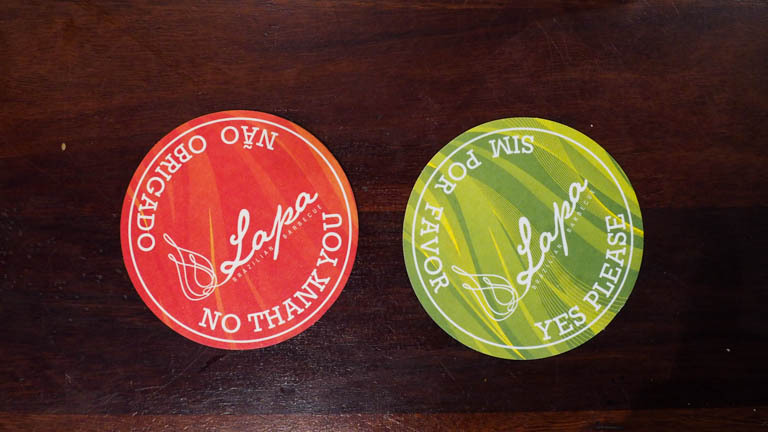 The uniqueness about eating here is the table-side service and dining format; Lapa provides not only the answer to a carnivore's wildest prayers but a dining experience that captures the joy of eating out together, especially through the social interaction and hospitality provided by forever happy and friendly waiters. Upon hearing the words 'African Grill', nothing really comes to mind quite as quickly as meat. Glorious meat. 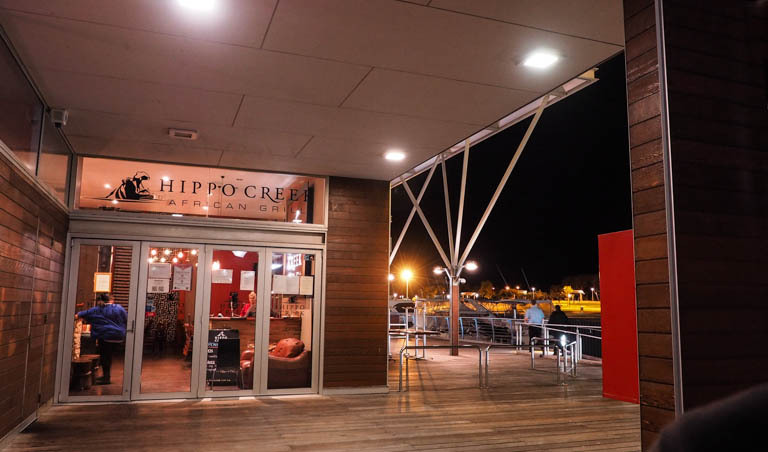 Hippo Creek African Grill has quite the connotations of delicious cuts of steaks and other exotic meats flame grilled to glistening, juicy perfection. I've come to satisfy my permanent meat craving and have taken advantage of their 50% off Dimmi deal for dinner. As we are directed to our seats we walk past multiple tables with the restaurant's signature dish; the Hunters Assaghai - a massive hanging skewer of marinated and chargrilled beef literally dripping with jus and butter. Not only is this such a novelty, it is a spectacular masterpiece of a dish. I make a note to order their famous camel, emu, buffalo and crocodile meat skewers, but was surprised to see this is no longer on their standard menu. The restaurant now has a seasonal menu, which diners can order from alongside their standard restaurant menu. Dishes like crocodile curry with cornbread definitely stood out and appealed to my curiosity, but I remember my indifference towards the white meat which tasted like a drier version of chicken breast meat and ordered the mushrooms as entree instead. It doesn't look like much, especially when I wrongly assumed they would be thickly stuffed mushrooms. The size of the mushrooms leave you craving for more, as their natural flavour and texture pair so perfectly with a slightly zesty and crisp lemon crumb and a blood plum vinegar sauce. It's such an interesting and surprising place to find a refreshing sour flavour in the fine crumb layer beneath the mushrooms. 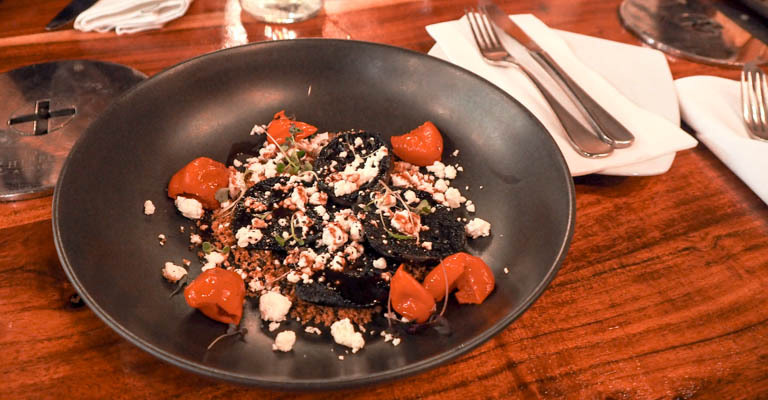 Adding to the crisp and chewy texture is the creamy crumbs of goats cheese scattered over the dish alongside some beautifully soft roasted peppadews. Resembling mini capsicums, these peppers are sweet and add bright pops of colour to the dish. After this spectacular entree I'm preparing myself to be wowed. If we had only ordered the garlic bread as a starter, I wouldn't have been so enthusiastic or optimistic about the rest of the meal. The garlic bread is sliced into thick portions but unfortunately the all important garlic component of garlic bread is missing. 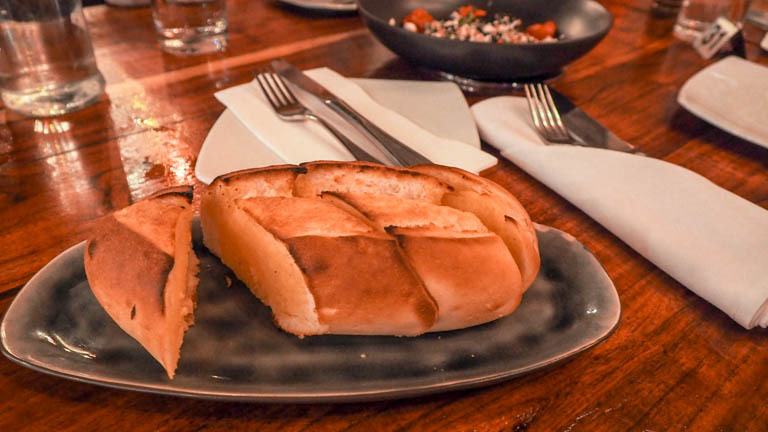 It is warm and buttery on the bread's fluffy inside and the loaf is toasted enough to give a crunchy crust, however does not satisfy as much as a fragrant and garlicky piece of golden garlic bread. Our waitress for the night looks after us very well and was great at recommending some must-try plates. Her pick involves The Braai, which already had me salivating with its multiple mentions of different proteins in this extravagant meat platter. 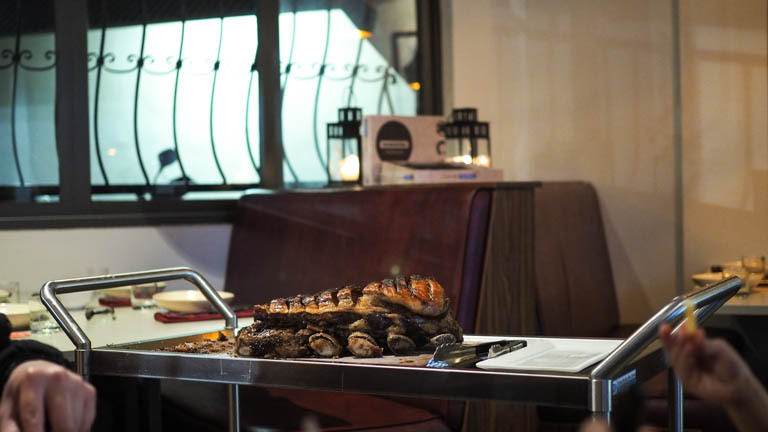 Intended for sharing between two, it involves a 300g Angus rump cap, 200g of boerewors, 200g marinated chicken thigh, 200g pork ribs, grilled corn on the cob and is served with either fries or mash and a choice of a sauce. Overall this dish is a winner; the meats are all marinated well and have a great smoky and barbequed flavour coming through. The chicken thigh is succulent and not at all dry - I've yet to come across a juicy breast! I'm a big fan of sausages so I do enjoy the boerewors; it is heavily seasoned and has a strong spice flavour. Not everyone was a fan, so I finished this one off. In comparison to the other steak we had ordered, the Angus rump cap really couldn't compare but on its own was cooked to a nice medium rare. 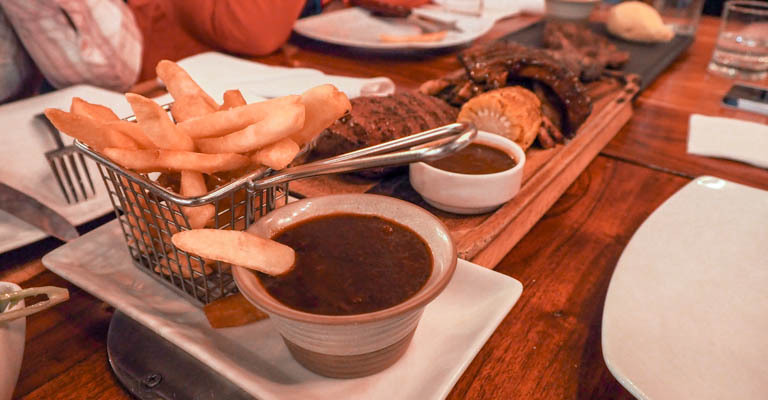 Some dishes come with a choice of sauce, which can be chosen from a house BBQ, monkeygland, peppercorn, onion jam, mushroom, peri peri, blue cheese, garlic and peri butter. Intrigued purely by the name, I opt for the monkeygland sauce and discover it is a ketchup and bbq sauce concoction - reminiscent of chutney in many ways with a tangy flavour. Following the initial feeling of foolishness for ordering another serving of ribs when it was already included in the Braai platter, was a bigger feeling of relief and wisdom because it was just SO DAMN GOOD! (200g would have been enough to satisfy one person, and probably as a snack only). 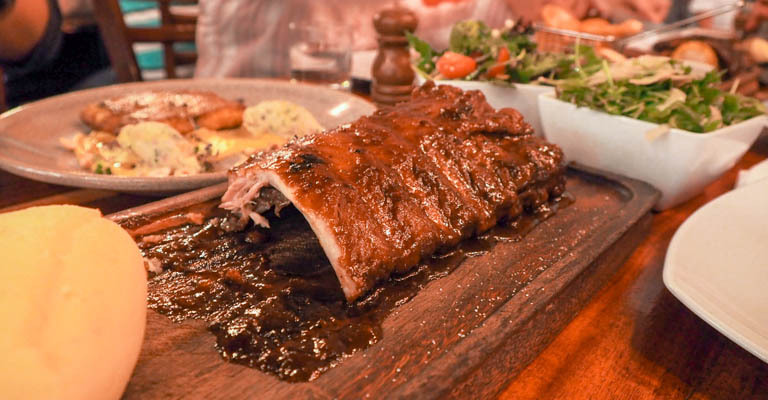 The pork ribs are glazed in the restaurant's own basting; a sticky film of sweet, tasty sauce that fully coats the rack of ribs and is served with a side of mash or fries. This is the type of food to dive in with your bare hands without giving a hoot about what anybody else thinks about your reckless eating ways. The ribs are unbelievably easy to carve into and the meat is so tender that it comes off the bone with a soft bite. This isn't to say it is soft until the point it has no meaty texture though! Cutlery shouldn't even be an option - this is definitely one for the fingers and provides a great kind of messy eating that screams delicious. Wagyu is famous and loved for its high marbling throughout the beef that gives it a luscious, full flavoured taste. Whilst I have had wagyu beef before, I am certain this is the first time I understand what all the fuss is about for a great steak. As a bold statement, this is quite possibly the best steak I have tasted; it is tender, cooked to a perfect medium rare and the moist, juicy, nearly creamy texture really (for a lack of a better description) melts in the mouth upon chewing. I have eaten wagyu before but did not like the excessively fatty composition - it was so concentrated that it was literally a mound of fat on the steak. This steak's fat content was very evenly distributed and I savour the few decadent mouthfuls with the chunky sauce exploding with mushroom flavour. Perhaps slightly out of place in a carnivorous feast, the two salads were relatively small in size but were fresh and light. 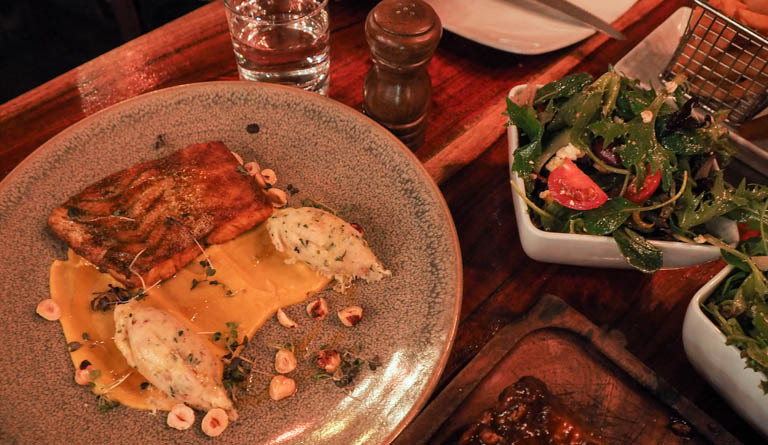 I had no idea seafood was on the menu at this African steakhouse restaurant and happily order a grilled barramundi as a break from the heavy meat dishes. Fish is one of my favourites and I always find comfort in a piece of well-cooked fish and this one is no different! It rests atop a generous smear of sweetcorn puree, toasted hazelnuts and supposedly some curry crisps which I wasn't sure where they were. The component on the plate which had us intrigued was the brandade - two mounds of what looked like herbed mashed potato but tasted like otherwise. I had no idea what I was eating at the time but I liked it! It tasted strangely familiar but I couldn't state what I was eating; it had a mild salty flavour and the texture of mashed potato, and it is only after some research that I learn it is a salted cod and olive oil emulsion - gasp! It was a pretty firm decision that no desserts were going to be ordered, but sitting around idle for a few minutes after dinner quickly changed that hazy, irrational decision. 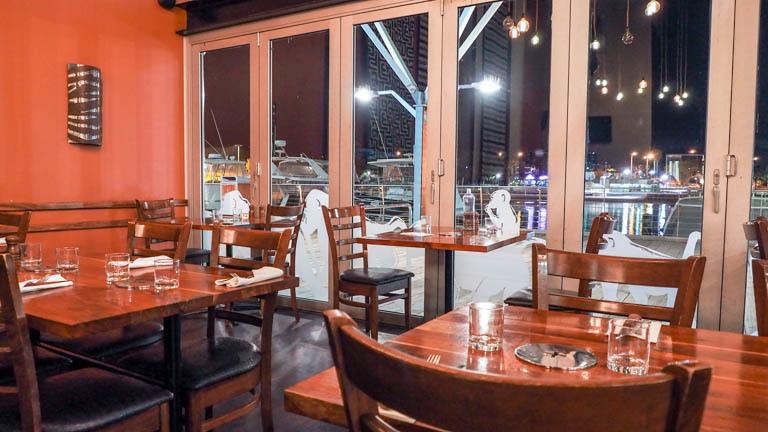 I felt really bad asking whether we could have the dessert menu since the kitchen was nearly closing, they had started to clean up and we were the last of two tables that were left standing, but the staff were completely accommodating and assured us that it was okay. This was great and consistent service throughout the night! Going with the recommendations of our waitress, the desserts definitely satisfied and rounded out the end of dinner really well. This warm apple, pear and vanilla dessert is like an open apple crumble; sweet and soft stewed fruit topped with a baked hazelnut crumb that married the softness of the fruit so well with its crunchy texture. The real reason why I agreed to this dessert was the ginger bread ice cream - the intensity of its flavour tasted just like crushed gingerbread biscuits churned into ice cream form. Its warmth makes it such a comforting and homely winter dessert. 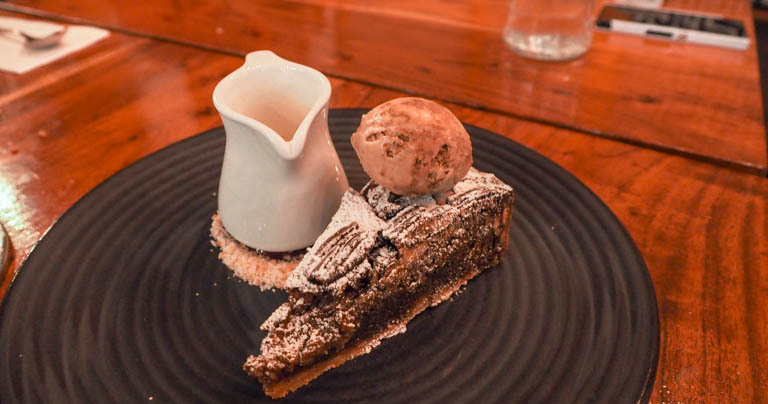 My preferred dessert was this pecan and walnut tart; it was a satisfying portion with a good level of sweetness and richness. The chocolatey tart itself is slightly gooey with a top that crumbles the way a cookie does. I'm such a big sucker for nutty desserts and the crunch of the pecans and walnuts is right up my alley, but those who aren't nuts for nuts might find the texture excessively hard to eat. The tart is served with a pot of frangelico custard that we fully drench the tart with. 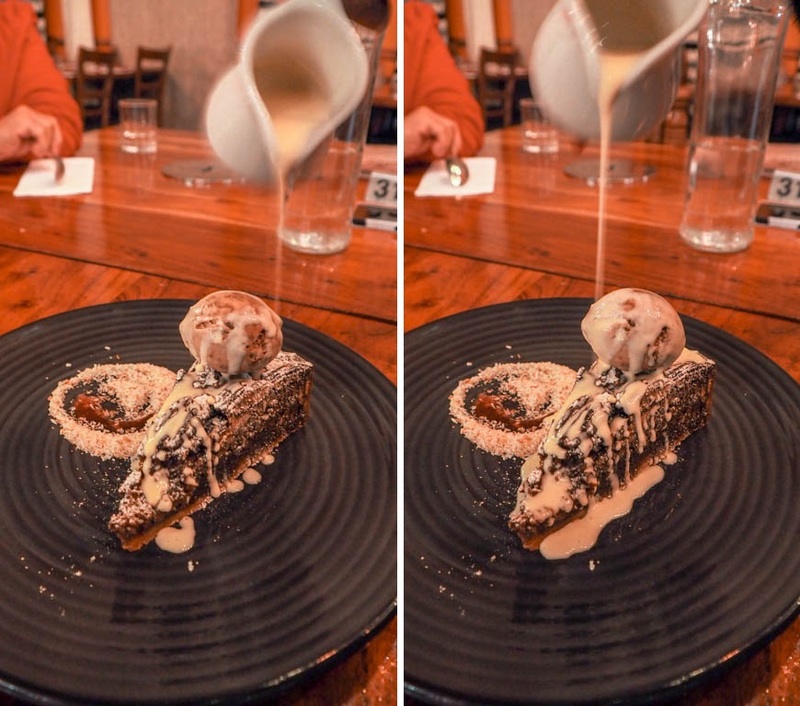 The custard has quite a runny liquid consistency to it and the smooth, chocolatey mocha ice cream was a great match because let's be honest - ice cream is the one versatile thing that is a perfect match for anything. This kind of dessert brings me instant gratification because it's everything I love: chocolate, liqueur desserts, nuts and coffee ice creams melded together. This is love at first bite, and every bite after. 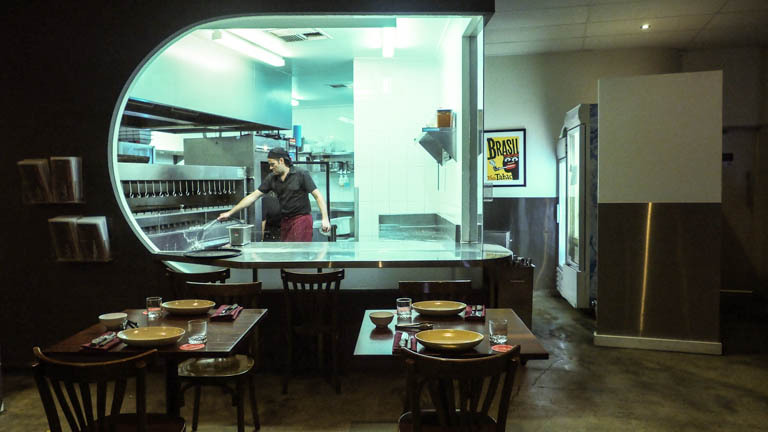 Whilst I embrace the changes of the revised menu of the restaurant, nostalgia hits when memories of devouring huge meaty skewers are a thing of the past. 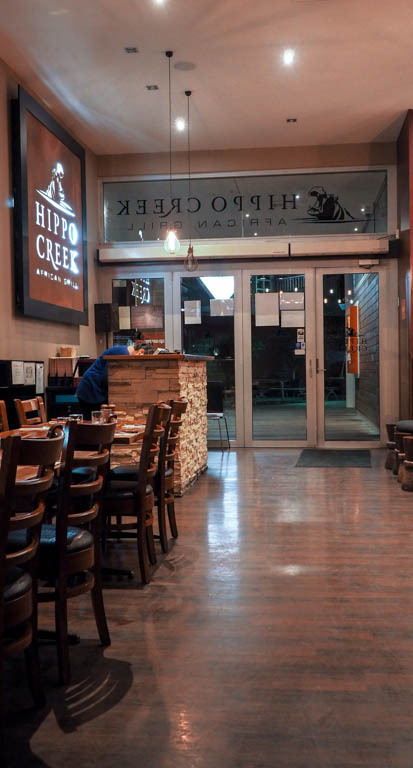 Fortunately I do find the steak is always cooked consistently well here and I've never had one that has not lived up to the grandeur of the Hippo Creek steak reputation. The prices are very dear but do reflect a piece of meat done well but never well done, because then it tastes like dehydrated cardboard. Ultimately it is your own decision whether you want to justify forking out big bucks for a rack of ribs and some chips. I wouldn't, but the value and happiness that the Dimmi offer brings brought us a satisfying meal. 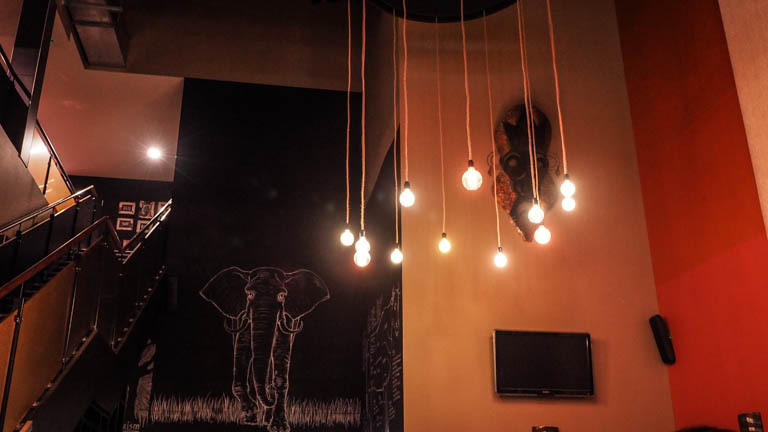 This elegant, tribal themed steakhouse has earned itself the reputation of serving authentic South African style cuisine, and in comparison to parting with my money to some other supposedly high end classy restaurants that tout about serving a mean steak, I prefer this family-friendly, non-pretentious restaurant all the way to the woodfired grill and back. All images property of Hungry Again Perth. Do not use without permission. Please contact me and reference this blog if images are borrowed - nobody likes a stealer! Hungry Again Perth. Simple theme. Powered by Blogger.